LVD Strippit now offers expanded turret capacity for 20-ton models of Strippit V-Series punch presses. The Strippit V20-1225 and Strippit V20-1525 punch presses are now equipped with a newly designed 47-station turret featuring three standard 3.5” (88,9 mm) auto indexable stations and four standard 2” (50,8 mm) stations. The larger turret capacity provides high flexibility and reduces set-up time, increasing machine productivity. Every station accepts shaped punches and dies and can be enhanced with the addition of indexable multi-tools to further expand turret capacity and flexibility while reducing set-up time. Quick-change die holders also minimize tool changeover time. The Strippit V-Series utilizes all the latest tooling technology such as special forming tools, wheel-style tooling, tapping and deburring systems. An Energy Reduction System (ERS) ensures that electrical power usage is efficiently managed. ERS reduces energy consumption up to 30% compared to older machine designs, making Strippit machines among the world’s lowest energy consuming punch presses. The Strippit V20-1225 and Strippit V20-1525 are equipped with three programmable, re-locatable work clamps, which can be programmed to a position on the X carriage and individually relocated to a new position within the part program. This reduces or eliminates “no punch” zones, increasing material utilization and providing significant savings when punching stainless steel and aluminum. The punch presses also feature an innovative table design with the capacity to handle sheet weights of up to 322 lbs. (146 kg). A state-of-the-art, PC-based Fanuc control is easy to use and proven reliable. The CNC control provides powerful features such as diagnostics, offers large program storage capacity and networking capability with user friendly MMI (man-machine-interface). 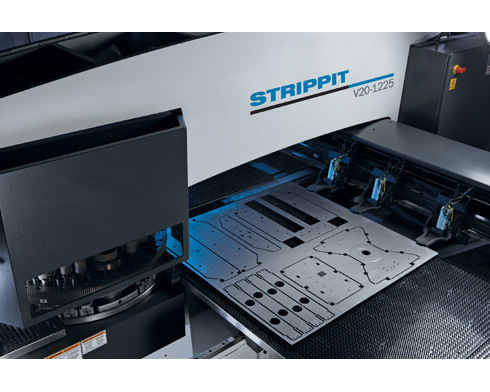 Strippit V-Series machines are equipped with an advanced servo-driven hydraulic press drive optimized for high-performance operation. Axis speeds of up to 900 hits per minute on 0.40” (1 mm) centers are achieved. This entry was posted on Friday, June 8th, 2012 at 10:12 am	and is filed under Events, Punch Press, Uncategorized. You can follow any responses to this entry through the RSS 2.0 feed. You can skip to the end and leave a response. Pinging is currently not allowed.